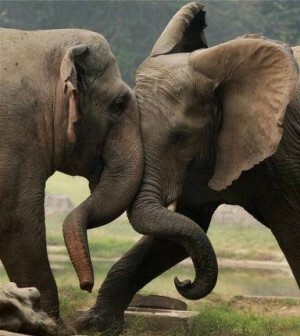 ﻿Bruce Goodman's "An elephantine love affair"
Kwanza was an African elephant – from Botswana. Minrada was an Asian elephant – from Sri Lanka. They fell in love. That was years ago. They’re still together. No kids. They alternate between eating leaves and grass. And they came to realize fairly fast that they DID in fact marry into each other’s culture.